I’ve posted in the past on how I use the heat at hand in a closed car for drying herbs. 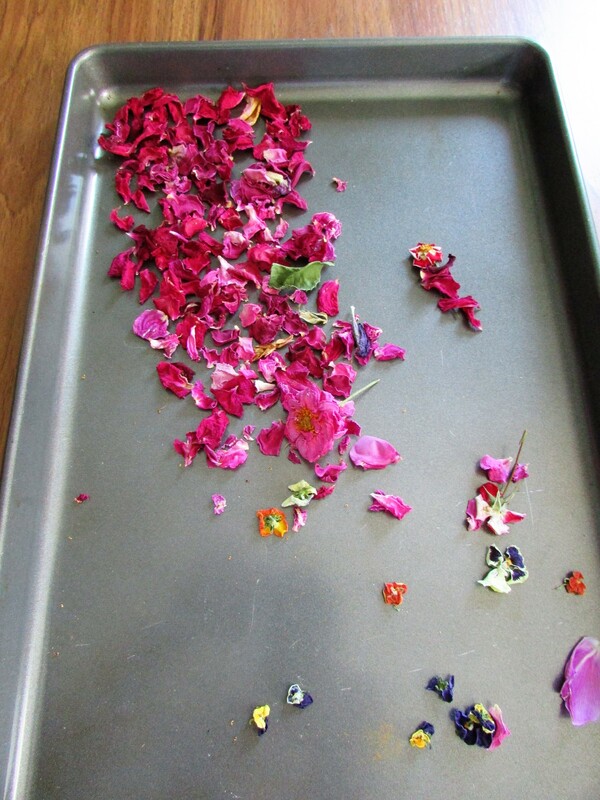 A few days ago, hoping to save the scent and color of a few of my rose petals, I dried them in my car. A metal cookie sheet works best for me. 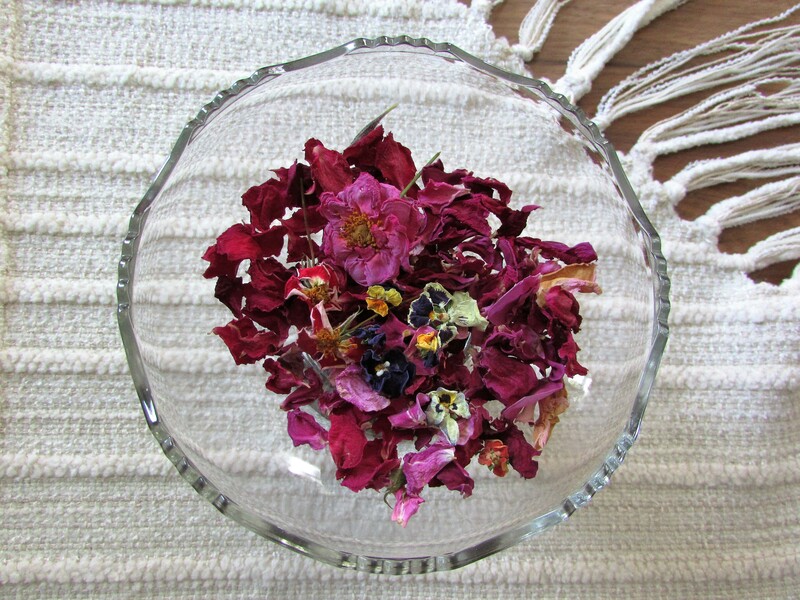 I spread an even layer of my flower petals, or herbs if that is your choice, and leave them in the closed car. Within a few hours I have dried plant material to use for projects or in my cooking. 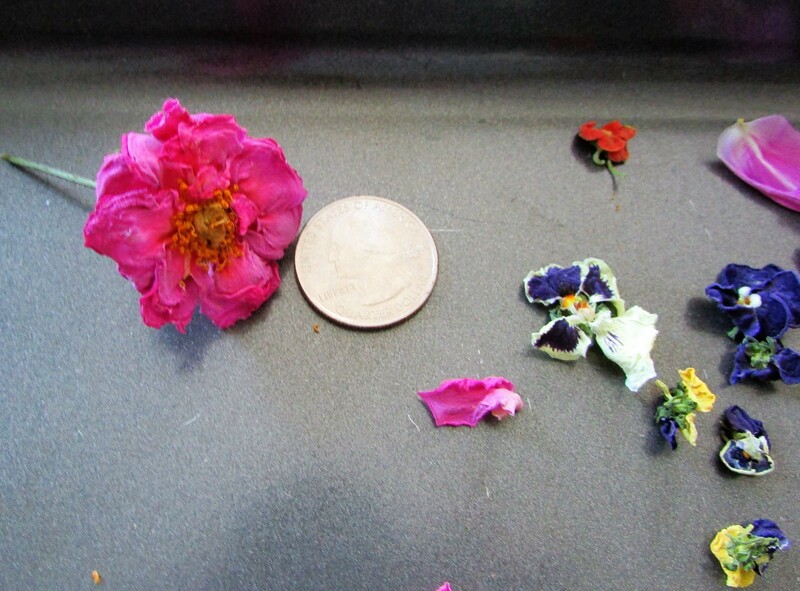 Blue Lagoon rose and pansy with a quarter for scale. The flowers shrink down to about half their original size, and retain their vivid colors. I can add a few drops of rose essential oil, or another flowery scent, to enhance their natural fragrance. Give this a try…I promise you it’s amazing! Great idea. Do you have a youtube video about this ? I think it will inspire others to create potpourri too. I’ll have to gather some petals as soon as the roses are blooming again, right now they are in the budding stage again, probably in about a week I’ll have more roses…then I will update. Have a blessed Sunday Susie. Kathy, thank you. Saw this just today( Monday). I am having a few baby pink roses on one of my terrace roses – this at 43 degrees C in the shade. Amazing resilience, don’t you think ? Aren’t roses something wonderful…they always fill me with joy. I’m so happy to hear of your success…yes they are resilient for sure. Any progress on your cross?